Sunday was just not a good day for me to be anywhere near bicycles. First, my Breezer fell off the back of the car (last post), and later in the day I was actually pulled over on City Park Rd for “running a stop sign”! Just a bad karma day or something. Lights, siren (woop woop) and everything. Unbelievable. Now, if you’re annoyed by whining, then feel free to stop reading now. ‘Cause I’m going to whine. Getting an actual traffic ticket for not coming to a complete 100% stop and putting my foot down – which is supposedly the law according to this fella from the Travis Cty Sheriff’s dept – is in my humble opinion completely frivolous. Now I’ll grant you that it makes sense to stop, look and listen, but IMHO, the issue should primarily be one of actual safety. The reality is my right turn was not unsafe. I was just coming up a very long hill and since City Park is generally a busy road, I was going at most somewhere in the 3 – 5 mph range and watching closely. Probably going no faster than your average jogger. I was not blowing through the stop sign at full speed. I had ample opportunity to see traffic and easily had space and ability to fully stop if anything was coming. A ticket just seems a little excessive. Given that he was just sitting there down the road a few hundred yards attempting to snare speeders, I think it’s more likely he was just out to write a few tickets that afternoon. In Idaho, the law allows a bicyclist to slow down before a stop sign and then make the decision to continue through if there is no traffic, or to stop if another bicyclist or vehicle has the right of way. 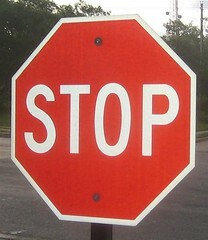 The stop sign law has been in place for over 20 years and has been shown to work very well. Seems to me these folks in Idaho are practical folks. Read the statute yourself. And as long as I was searching, there’s nothing in the Texas Transportation code that I can find that seems to suggest that putting your foot down is actually required. It just says you have to stop. Maybe it’s there, but I didn’t find it.